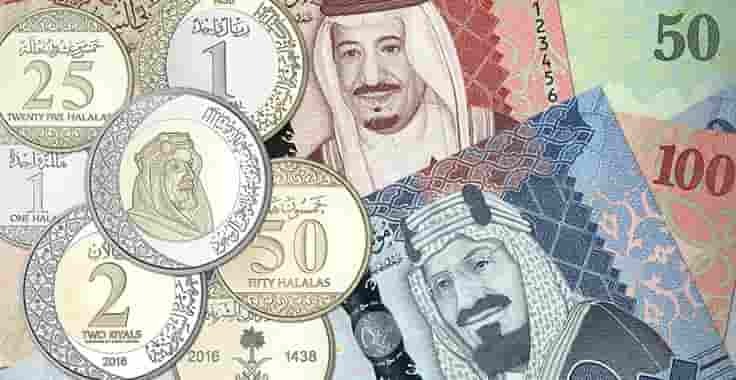 Saudi Arabia's King Salman last year officially launched the the new designed Saudi currency notes and coins with its first set of all categories of notes and metal coins. The new currency reveal the new faces of Two Riyals (SR2) coin, One Riyal (SR1) coin, 50 Halalas coin, 25 Halalas coin, 10 Halalas coin, 5 Halalas coin and 1 Halala coin with the printed year of 2016 and 1438 on it. - New Two Saudi Riyals coin and One Saudi Riyal coin have a image of King on the back side of the coin, While in 50 Halalas, 25 Halalas, 5 Halalas and 1 Halala coins backside have Saudi symbol of Palm tree and two swords. - New Five Hundred Saudi Riyals(SR 500) contains the image of the Holy Mosque Makkah, image of Kingdom's King and the Emblem of Saudi Arabia(Palm tree with 2 swords). - New One Hundred Saudi Riyals(SR 100) contains the image of the Holy Mosque Madina, Image of the Saudi's King Salman and Saudi Emblem symbol of Palm tree with two swords on it. - New Fifty Saudi Riyals(SR 50) contains the image of the Al Aqsa(Palestine) Mosque, The image of the Saudi Arabia's King Salman and the Saudi Emblem. - Similarly, The New 10 Riyals(SR 10) and 5 Riyals(SR5) notes also launched, No more 20 Saudi Riyals note and 1 Riyal Note. - The sizes of the notes are similar to the old notes size, SAMA gets its new name as Saudi Arabian Monetary Authority on new currency, Earlier SAMA was Saudi Arabian Monetary Agency.